You might wonder what all this has to do with faith and practice? Let me explain. Selfies are the rage and everyone, it seems, is posing for them. Young people visiting the Vatican a few months ago asked Pope Francis to pose with them for their selfie. The Catholic News Service printed a photo of the pope with these five young adults (August 28) holding their smartphone while they were taking the picture. Pope Francis is beaming! Donald Trump took a selfie to show his famous hair. P. Diddy took one with the Mona Lisa. (I bet the curators would have had a fit if they had caught him!) If you Google the word selfie you’ll see quite a lot of famous photos show up. 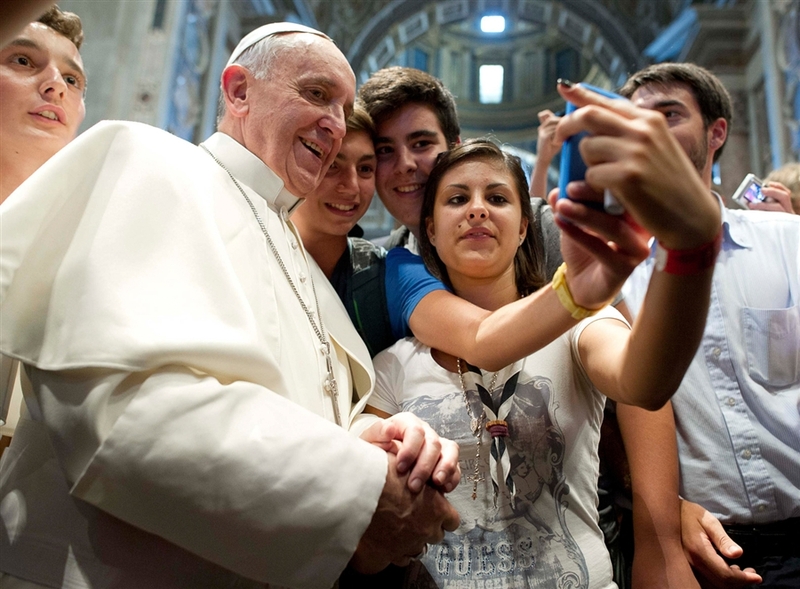 Consider this: What if Pope Francis had turned down these young people’s request for their selfie photo? He could have easily asked for a more posed picture but he seems so completely unassuming, and comfortable, that he was happy to accommodate their request and smile for their camera. I am amused by the Catholic left and right at the present moment. My ideologically rigid rightward Catholic friends often say nothing about Pope Francis or they respond to my zeal negatively when I express profound joy. On the left I hear things like, “I hope he is more than mere words and that he deals with doctrinal changes I think the church needs to make.” Both sides miss the point. Pope Francis is neither a liberal or a conservative. He is not even a moderate, as CBS suggested. He is the pastoral head of the Catholic Church. He is a devout, faithful, orthodox Catholic. What confuses so many is they do not know what that actually means. They have so associated their views with the church’s view that they cannot hear God speaking through the pastor he gave to their church. I remember as a young man seeing the 1968 movie, The Shoes of the Fisherman. It is the story of the first Russian pope (Anthony Quinn), a man of peace and spiritual transformation. It is based on a work by the Australian novelist Morris West. What I never dreamed was that I would actually live long enough to see a pope who lived like the man in that old movie. In this instance the reality is much, much better than the movie’s ideal! I think you hit the nail on the head in this one John. Not a conservative, not a liberal, rather a pastor. Al Andres liked this on Facebook. Jennifer Fenton liked this on Facebook. John, thank you so much for this post, my brother in Christ. I’m Catholic, I can say, you “get” Pope Francis much better than many of my Catholic friends. I loved Benedict XVI, and I love Pope Francis, because both of them have pointed me to *Jesus* and challenged me to a deeper life of faith in Him! Thank you Christopher. I love the catholic faith and the Catholic Church. I love the Orthodox Church. I love my Protestant families as well. My love grows deeper by the day and I learn from all faithful Christians. Yesterday, I shared life with a Protestant public leader and then a local priest. God is good and his love amazes me and floods me with deep joy in the presence of all his saints.